St Pancras station in background. The black poplar is one of the native trees, i.e. it arrived in Britain, naturally, before the English channel formed. It has fewer branches than the London planes, but what branches there are, are more powerful. The leaves are triangular or pear shaped. In the case of the trees at Joseph Grimaldi park, they are large, but generally their size is proportional to the size of the tree. 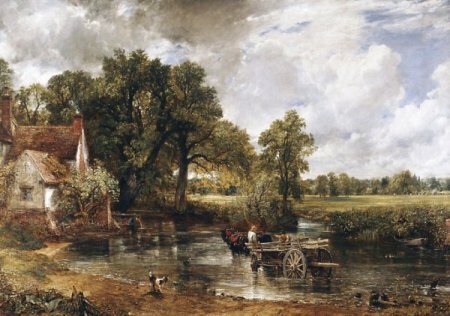 It used to be a much more common tree in Britain, hence it is featured in Constable's famous painting: the Hay Wain. It is rare in central London, because it likes to grow by water, but there are three large ones and a small at Joseph Grimaldi park. Trees at St Paul's, London. Remember to click on the images. Vary in size depending on the size of the tree; triangular shaped, dark green above, light green underneath; alternate. capsules; when they split, they reveal a cotton wool type substance which can be seen on the ground around the tree. don't last long in the spring and appear before the leaves. grows to about 35 metres Sometimes with very strong branches which form a Y shape with the trunk. general: something of a rarity in London but the ones that are about are good examples. There is also one in Russell Square.